With every year comes a new chance to re-commit to your business and up-level your website design. You know it’s time for a fresh new look so you can tackle your big goals, and I’m sure by now you’re sick of shoe-horning text, images and content into a DIY website design template or old design that no longer serves or feels like you anymore. Maybe your website is so old that it’s not responsive for tablets or mobile phones, so you’re losing some seriously precious mobile website traffic. But how do you go about the process of finding a Designer to help with your re-brand? I mean, this isn’t something you do every day. Where do you find this magical, mythical creature that can not only create something beautiful, but also something functional, that will get you the customers you deserve? Pay attention to websites you like, and see who designed them. Google “web designer” or “web designer + your city” (or any other search term you want) and see who comes up. Whoever rises to the top of your search probably knows a thing or three about SEO, so you’ll want to align yourself with them. Ask for referrals from fellow business owners. If you’re reading this, you’re an entrepreneur, and likely have some business buddies. Ask them if they’ve used a Web Designer, and what their experience was like. Though it’s super important that your business buds personally liked the Designer and their end product, what’s even more important is if the new website helped increase their revenue, client list, e-mail list, etc… After all, pretty pictures online are great, but “pretty” doesn’t pay your mortgage. Now that you have some examples of how to find a Designer, how do you determine who to hire? If the Web Designer you’re interested in doesn’t have a website, move along to the next candidate. It’s 2019. This isn’t amateur hour. A bad website is better than having no website at all, and you need to hire someone who takes their business and their job seriously. Having a website at all is a part of that. If your prospective Designer doesn’t take their business seriously, I guarantee they won’t be taking yours seriously, either. Look at the Designer’s website. View their portfolio, read about their design packages + prices, view their testimonials and their “About” page. In short? Do your homework. Does their website seem up-to-date with the latest technology, marketing, and design techniques? Do you have a feel for who this person is, and do you like/get a good vibe from them? Do you know what their unique point of view is, and what makes them special over someone else? Is it clear that they care about how they can help your business, whether that’s increasing your customer base, revenue, e-mail list, etc…? Does their portfolio of work resonate with you? Do all of their portfolio pieces look like the same design style, or does each project look unique and special for that specific client? Do they have a project similar to yours already in their portfolio, so you’re sure they can do what you want? Do they have testimonials on their website, and what kinds of things do people say about them? Are their prices on their website, and can you afford them? What is their availability like? Can they start right away, or are they booked out months in advance?Is it easy to find a “Contact” page on the Designer’s site so you can contact them about your project? There are lots of considerations here, and that’s for good reason. 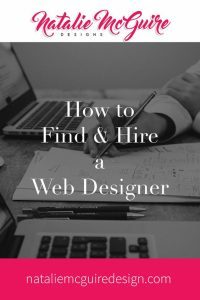 Working with a Web Designer is serious business, and oftentimes you’ll be working with them for several months, so it’s crucial you understand and pick the right person for your job. Contact the Designer and see what their on-boarding process is like. If you contacted them during the work-week, did they respond within 24-48 hours of your inquiry? Is their response kind, professional, organized, and guide you through their next steps? Will you have a chance to talk to them over the phone, Zoom, Skype, or a Google Hangout so you can get a feel for them and get any lingering questions answered? Do they write a proposal or contract that clearly outlines the scope, timeline, price, and process of your project, and is it clear what their policies are for payment, cancellations, communication, liabilities, etc…? If at this point all of your questions are answered, you feel like the Designer understands you + your project, cares about you + your project, and you just plain like them, then pull the trigger and hire that person. Sometimes, at the end of the day, it’s your gut that knows where to guide you. I wanna hear from you! Simply come on over to my Facebook page and tell me what other things you look for in a Designer, and if you have plans to re-design your website. I know we could work together to create something truly memorable.